In The Kitchen: Men Who Cooks Chef Rob VanEgghen along with Lisa Savoid from Team Inc.
Today's Dish: Happy Birthday, Prince Louis! 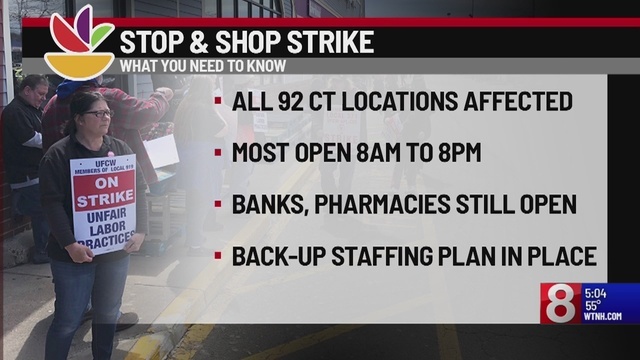 (WTNH) - Saturday marks day three of the Stop & Shop strike happening across Connecticut and parts of New England. Workers walked off the job Thursday after contract negotiations came to a stand still. Union leaders were back at the negotiation table with corporate managers of Stop & Shop since Saturday afternoon. Many shoppers have no choice but to cross the picket line and some were faced with hostility and sarcasm. Teyanna Carey, a shopper said, "It kind of took me by surprise, because they were harsh, they were like, 'listen you guys are not going to support us', when we came out they were kind of sarcastic, and said 'thanks for the support'...I did feel a little bit bad at that point." Stop & Shop said they are ready to get back to the bargaining table and the union steward tells News 8 they will join them when the company has a better offer. Connecticut's Democratic Governor appears to be headed on a collision course with the Democrats that control the General Assembly.